Bush made five saves Saturday to anchor Montreal's 1-0 MLS win over the Columbus Crew in its home opener. The shutout was Bush's third straight as the Impact Impact (3-2-2) is unbeaten in its last three games. Harry Novillo's first MLS goal —scored at the 55-minute mark — was all the offence Montreal would need. "The saves Evan made had such a big impact on this game," said Novillo. "Some of his saves are like goals for us. "He keeps us in the game after we make mistakes. Evan did what he does best. A big thank you to him. It led to the three points." Montreal captured the win following scoreless draws against New York City FC and D.C. United on the road. The Impact haven't allowed a goal in 276 minutes. "We've been good defensively," said Bush. "Eleven guys go into having a clean sheet. That goes from me to Maxi [Urruti]." After starting the season with six consecutive road games, Montreal played its first match at Saputo Stadium before 18,634 spectators on a warm but windy afternoon. It was the Impact's third contest in eight days. Bush made saves in close on Federico Higuain in the 22nd minute and another on Robinho in the 27th. The Crew came close again in the 39th minute when Gyasi Zardes's shot curled just wide of the post to Bush's left. 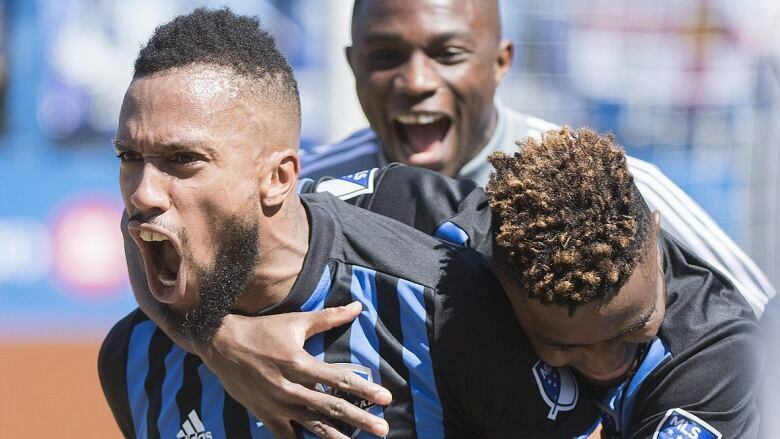 "I was told that the season just before I came was not a good one for Evan," said Impact coach Remi Garde. "We had to work a lot on his confidence, on his game. "I'm happy to have Evan to stop those shots but I prefer we didn't use him so much." Montreal broke the scoreless tie on Novillo's first goal in an Impact uniform following sloppy play at the back by Columbus. "That's Maxi Urruti's speciality, his pressing," said Novillo. "We can't follow him because he runs so much. That's how pressing wins games. "He controlled the ball, turned and gave me a perfect pass. All credit goes to him." The goal put an end to Columbus goalkeeper Zack Steffen's 499-minute shutout streak. "This was a game that we deserved more out of it," said Columbus coach Caleb Porter. "We played really well, we had good control. "We had more chances than they did. I can't remember a quality chance that they had until late when we were pushing for the goal. I remember six or seven chances that we had that should've been goals. I thought we were a bit unlucky in a few of those situations." Montreal earned its first victory of the season without midfielder Ignacio Piatti, who missed his fourth straight game with a knee injury. Piatti was injured in the Impact's 3-1 victory against Orlando City on Mar. 16.